Item #MS-174: 7.25" x 4" tall Turritella Agate bookends of 4.5 lbs. TW. Item #AM-AG-GEO-110: Approximately 8"x6.5" tall polished Agate geode (Brazil). Item #MS-768: Approximately 4.75"x5" tall Agate geode of 2lbs. 6 oz. 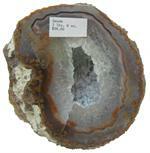 Item #AM-AG-GEO-60: Approximately 4"x4" tall Agate geode (Brazil) on wooden base. 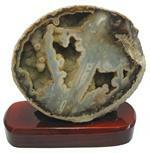 Item #AM-AG-GEO-135: Approximately 4"x4" tall Agate geode on wooden base. 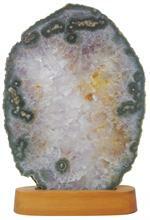 Item #AM-AG-GEO-125: Approximately 5.25"x5" tall Agate geode (Brazil) on wooden base. 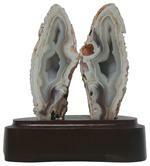 Item #AM-GEO-65-1: Approximately 3.75"x3.25" tall polished Agate geode on wooden stand. 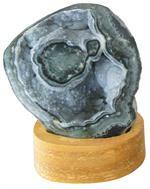 Item #AM-GEO-65-2: Approximately 4"x3.5" tall polished Agate geode on wooden stand. 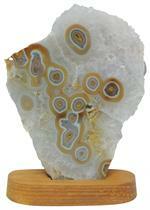 Item #AM-GEO-65-5: Approximately 4"x3.75" tall polished Agate geode on wooden stand. Item #MS-765: Approximately 4" x 3.75" Agate Geode pair of 3.41 lbs. 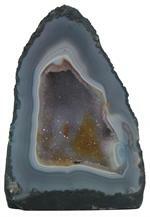 Item #MS-798: Approximately 5.25"x8" tall Agate geode with Amethyst Drusy. Item #MS-797: Average approximately 8.25"x.3.25" - 9.5"x 5" Citrine Agate dish.. Item #MS-776: Approximately 7"x6.5" dyed Agate geode of 12.70 lbs. on wooden stand. Item #MS-777: Approximately 3.75"x2" Kentucky Agate of .60 lbs. Item #MS-785: 35x61.5mm Kentucky Agate rectangle of 141.39 Cts. Item #MS-786: Approximately 4"x2.5" Kentucky Agate of .95 lbs. 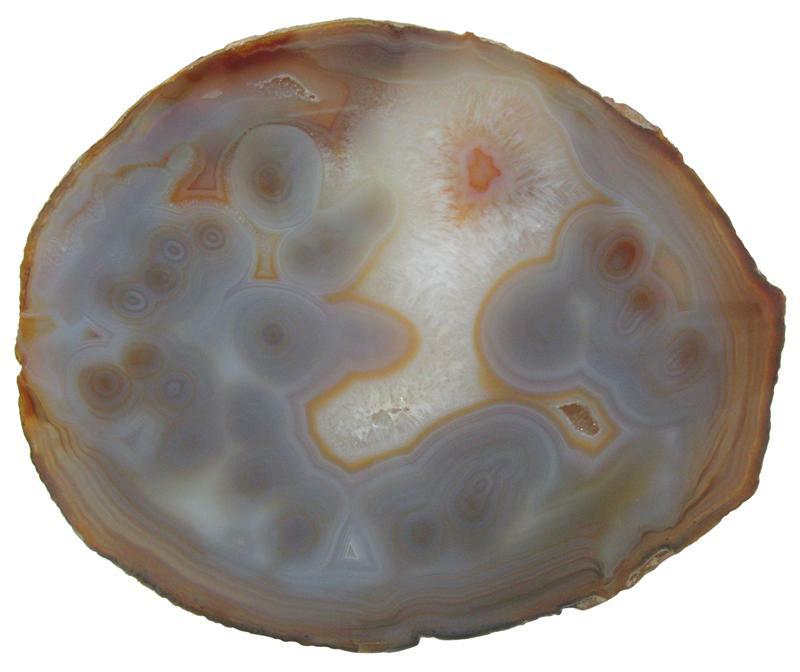 Item #MS-789: Average approximately 1"x.5" Kentucky Agate. Item #MS-796: Average approximately 1.25"x.75" Kentucky Agate. Item #MS-799: Approximately 1.25"x.75" Kentucky Agate. 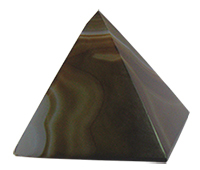 Item #MS-808: Average approximately 1.5"x1" Kentucky Agate. 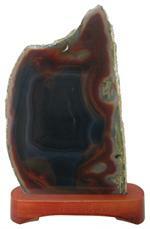 Item #MS-808: 1 7/8" x 1 3/8" Kentucky Agate. Item #MS-780: Approximately 5.5"x3.5" Kentucky Red Agate of 2.65 lbs. Item #MS-782: Approximately 6.5"x4.5" Kentucky Red Agate of 4.80 lbs. Item #MS-773: Approximately 6"x4.25" Kentucky Red Agate slab of .95 lbs. Item #MS-779: Approximately 3.25"x2" Kentucky Red Agate slab of 43.35 grams. Item #MS-791: Approximately 5"x4" Kentucky Red Agate slab of 3.30 lbs. Item #MS-807: 25x43mm Moss Agate double stalactite slice of 48.19 Cts. Item #MS-770: Approximately 1.75"x2.5" Moss Agate slab.